I’m all buckled into my buoyancy vest, air tank, weights, and I’ve donned my fins, mask and snorkel. I put the regulator in my mouth, breath air from my tank, shuffle awkwardly to the stern of the boat, then take a giant stride into the water. I’m floating instantly. I test out my gear, check my gauges and a few minutes later I’m descending with a group of six other divers and our leader. Our destination is a shipwreck called the St. Anthony, 70 feet below us, off the south shore of Maui. I’m cautious, as this is my first salt water, open ocean dive. I’m not nervous, but my senses are on high alert. I’m probably breathing a little too fast. I’m shocked at first by the clarity of the water. I can see everything, right to the bottom, even though it’s barely past dawn and the sun hasn’t climbed over the 10,000-foot mountain Haleakala that forms the bulk of Maui, so the water is still dark in colour. 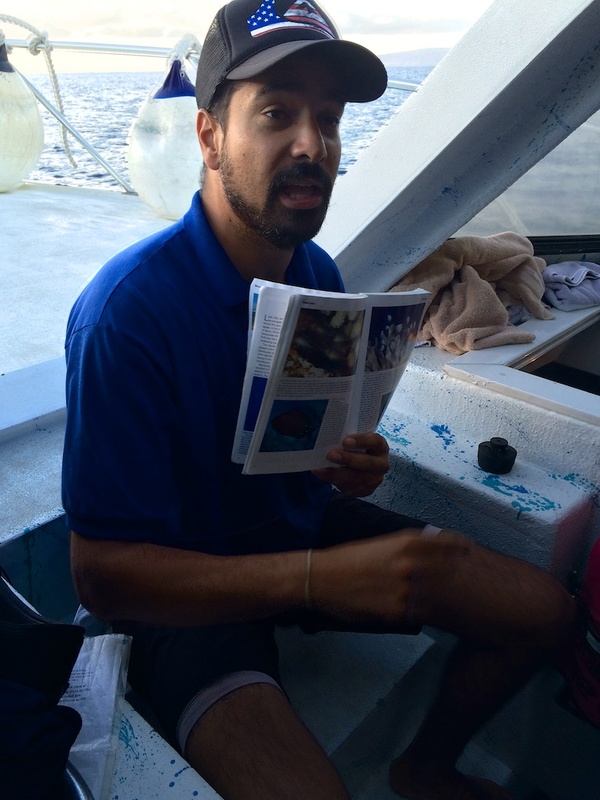 Our dive leader is Gill, a 6′ 4″, happy-go-lucky guy who briefed us for 20 solid minutes on the boat ride to our dive site. (I wondered: could a scuba dive leader have a more appropriate name?) I could not keep up with all the hand signals he taught us (dozens of them, including specific ones for each species of fish he expected we’d see – for instance, he mimed a syringe needle going into his arm for “needle fish”). But I locked onto his iron-clad rules: follow him, don’t swim ahead or dive deeper than him; communicate our air pressure with a hand signal whenever he asks; stick together; ascend when he gives me the signal. To drive the point home, since it’s hard to tell who’s who underwater with everyone in similar gear and no visible faces, Gill is wearing bright yellow fins and a green baseball cap perched backwards on his head. Gill is all about the fun and the education, but he’s first about the safety. I feel like I’m in good hands. I stick to Gill like glue on the descent. Slowly we go down, feet first, until we’re within about 10 feet of the ocean floor. It’s not as easy as it sounds, because as you descend and the water pressure increases, you become less buoyant and must inject minute amounts of air into your vest to keep from sinking too fast. I look around for my five fellow dive mates. Some are above me, some below. I momentarily lose track of Gill, my reference point. Suddenly, I see another diver descending, much too fast I think. I’m temporarily disoriented by his bubbles as he shoots by me. What’s up with that, I wonder? But now I can’t see Gill. I look up and am astonished – the other diver isn’t going down, I’m going up! Now I’m less than 20 feet from the surface and rising fast. Pretty soon I’ll be popping out like a cork. How embarrassing is that? Rookie mistake. I added too much air to my vest when I was near the bottom, and became positively buoyant without realizing it. If I’d had my eye on my depth gauge, which hangs on a tube by my left side, I’d have realized this instantly. In any case, my training kicks in and I dump some air quickly from my vest by pulling a little rip cord. I look down, spot Gill in his green hat, flash him the “OK” sign, and begin descending again to rejoin the group. No danger, no threat, just a novice diver on the loose, inexperienced in buoyant salt water. When I was a kid, I ordered a book from the “Scholastic” service that lasted me for many years. (Remember Scholastic, and the freedom to choose your own cheap paperback books from their intriguing collection of colourful titles?) It was called, “Up Periscope”, a World War II story about a submarine in the Pacific and a navy “frogman”, as divers were called back then. I guess the book came after the 1959 film of the same name (starring James Garner, who also starred in “The Great Escape”, same era, same sort of tense war story). The story seemed improbable, but it totally captured my imagination. The diver’s mission is to swim to an island in Micronesia held by the Japanese (specifically, Kosrae, about halfway between Hawaii and Japan). There, he has to sneak into the Japanese compound, drug a guard, photograph a code book at the radio station, and somehow return to the submarine undetected! He succeeds, although he has to kill a second Japanese guard who discovers him, and make it all look like an accident. He even swims back to his sub, which is lurking in the harbour, finds it underwater in the dark, and re-enters through some sort of air lock. Talk about exciting. Improbable? So what! Intoxicating? For sure! I think the book also had a romantic sub-plot, but at the age of eight that wasn’t what turned me on. And the story didn’t end there. On its return to Midway (the most northwest atoll in the long Hawaiian Island chain, still a US Navy base), the sub encounters Japanese ships. Of course, the sub crew must torpedo them, and then go through a retaliatory depth-charging. Here, the plot is like almost every other submarine story, including the movie “Das Boot.” They have to risk destruction by diving much deeper than the sub was ever engineered to go, then escape the pursuing destroyers and their sonar surveillance. Oxygen runs low, and CO2 levels climb. The crew is passing out, the walls of the sub are bulging from water pressure, the batteries that power the electric motors are dying. All seems lost until finally the sonar ping disappears, the sub escapes the net and it surfaces to blessed fresh air. The crew can restart the diesel engines (this isn’t a nuclear sub), recharge the batteries, and if need be, do it all over again. That’s the quintessential submarine story. Lather, rinse, repeat. 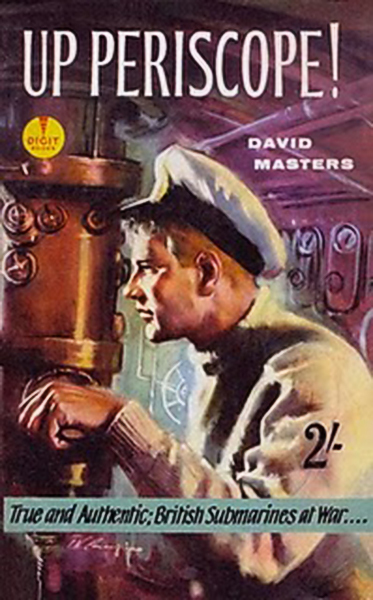 I liked Up Periscope so much that I re-read it every year, well into my teens, even though it was meant for a young reader. And a big part of my interest was the underwater aspect, especially the rigours of diving and the mystery of the ocean. I consulted maps of the places named in the book – tiny little islands, way out in the Pacific, impossibly far from where I lived in Vancouver, although connected of course. I also had a friend when I was young named Steve Cockcroft. His Dad and family were way more adventuresome than my own. They went skiing on winter weekends, to Whistler or Mount Baker. And Steve learned to scuba dive as a teenager. I don’t remember where he went, but he showed me his bright yellow tank, demonstrated the air pressure inside, and generally impressed me with what a dangerous, technical and intriguing sport it was. I wasn’t jealous but I was definitely envious of my buddy Steve. Finally, I grew up with a TV show called “The Undersea World of Jacques Cousteau.” I don’t remember much of it now. It wasn’t very dramatic (not like Up Periscope), just lots of fish and maybe some sharks, but it had an air of peril and the unknown. I didn’t realize at the time that scuba diving was really in its infancy when I was a child. 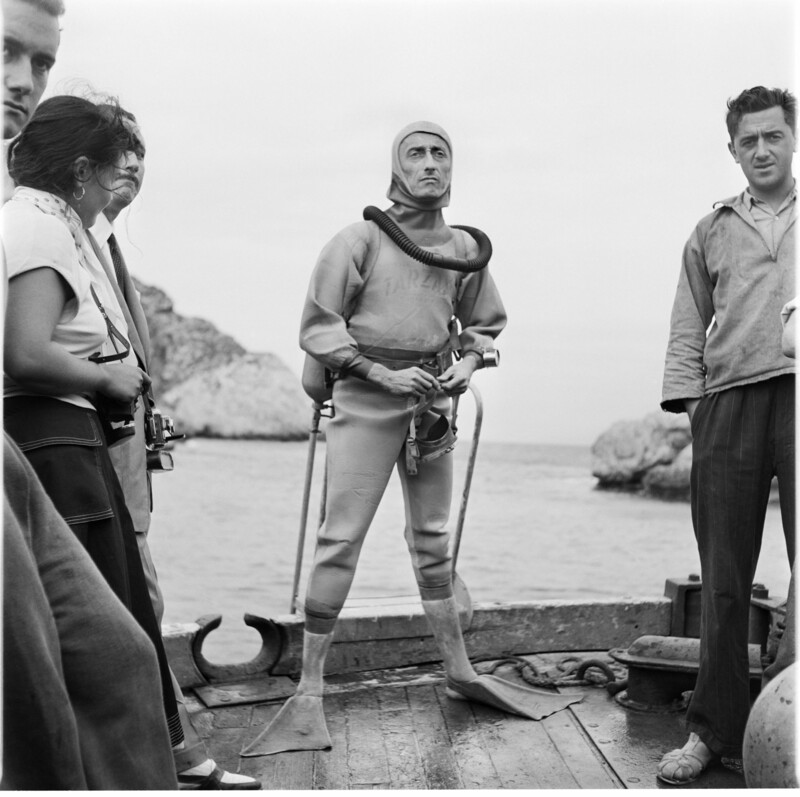 Jacques Cousteau was a pioneer, one of the first to dive successfully. I assumed people had been doing it forever, or at least since diving bells. In fact, it was life-threatening until World War II, when the regulator was perfected. Many died before the physics of water pressure and its effects on the human body became widely studied and understood, and the appropriate technology developed. I was vaguely aware of “the bends”, the popular term for what’s now called decompression sickness. It was portrayed in movies as writhing agony, usually resulting in death. I didn’t understand what caused it, although Steve Cockcroft seemed to know, and presumably avoided it somehow! Flash forward about 40-plus years. I’d always had a hankering that some day I would dive, somehow, somewhere, but didn’t really know how to go about it. Five years ago we went to Florida for a week to visit my in-laws, and I assumed I could just sign up to dive there. Beeeeep – NO! You must have a licence, which involves training, tests, practice dives, none of which seemed very feasible in southern Ontario, a long way from the ocean. Then last year I visited Maui for the first time, on a holiday with my sisters. One, then two, then all three of them began taking winter vacations there after my mother died in 2006. With my parents gone, it was becoming our family rendez-vous location, in place of Vancouver. I was philosophically opposed to visiting a warm place in winter (embrace the cold! ski! snowshoe! ), but I also needed to re-connect with my family, and not by FaceTime. I was lucky: could there be a better destination, even if it was pretty darn far away (five time zones)? My sisters and I snorkelled tons in Maui last year, seeking out clear water beaches, looking for the reefs off the rocky points at the end of the sand, instead of the clear but mostly empty water in the middle. 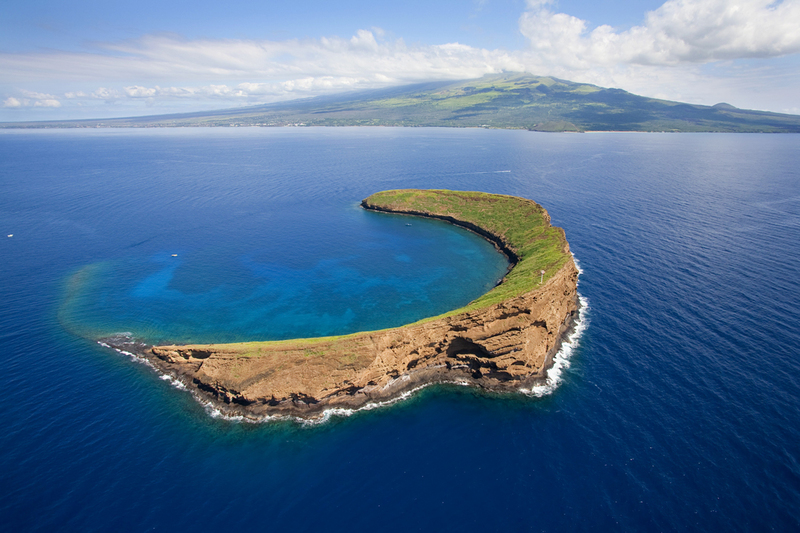 And we booked a day trip to Molokini, a tiny, volcanic crater remnant, barely above the ocean surface several miles off the south shore of Maui. We took an inflatable boat there one morning with about 20 other people, choosing the trip because we would be taken to both sides of the crescent-shaped islet: the inside shallow part, and the deep backside where few of the tourist boats go because of currents and waves. The backside of Molokini was a marvel. Its clear water fell away into a blue abyss. It was impossible to judge its ultimate depth by looking down as you floated on the surface. The wall of the islet, against which big swells were washing, was covered in coral below the surface, where schools of colourful fish were feeding. It was fascinating and majestic. And way down deep, perhaps 75 feet or more below us, we could clearly see scuba divers, slowly making their way along the wall, exploring carefully in a group of four, their bubbles rising around us to the surface. I hyperventilated and then attempted to dive as deeply as I could on a single breath. I couldn’t reach them, but I could descend maybe 30 feet or more before having to return quickly to the surface. I had a flash of desire. If I ever return to Molokini, I want to be down there with the divers, not stuck on the surface with the snorkelers. I felt sure of that. Every dream I’d ever had as a child, and every page of Up Periscope, told me that was my destiny. I got home from Maui on a Monday. 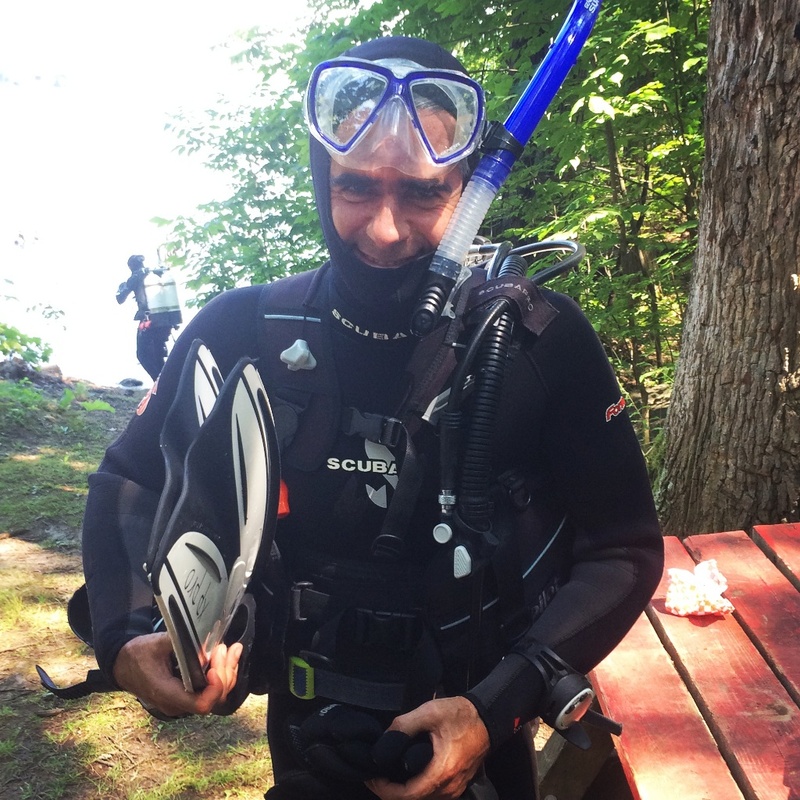 By Tuesday I had signed up for a scuba diving class that started the following Thursday at the University of Guelph. I loved it from the get-go. The classes explained the fundamentals of diving safety, the pool let us practice with the equipment. Later on, to complete our certification, we’d have to write a test, and then in the summer, complete four supervised open water dives (in the Thousand Islands of the St. Lawrence River). If we passed, we’d get an internationally-recognized recreational diver certificate, good for life, more or less. My class of 12 was populated almost wholly by students, mostly in zoology or biology, about half guys and half girls. I was the only one over 25 years of age. I felt a little conspicuous. 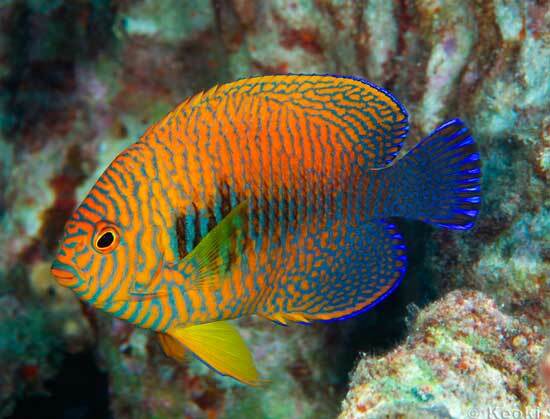 But I soon forgot about that as I made friends with this bunch of fellow aquaphiles. I was amazed by how much I didn’t know about water, and how much I didn’t understand about diving. The fundamental act of breathing underwater through a regulator is no skill at all. You just breathe. That’s it. Even as you descend, nothing changes. You inhale and exhale, although it helps conserve air if you learn to breathe deeply and slowly. I think most of us expected some sort of trick to scuba (which stands for “self-contained underwater breathing apparatus”); in reality, there was none. It was ridiculously simple. The only technique was one we were familiar with from swimming deeply in a pool or from snorkelling – to constantly equalize the pressure in our ears as we descend by pinching our nose and blowing. The difficult part of scuba is controlling your buoyancy. For every 30 feet you descend, the pressure of the water around you (because of the weight of the water above you) increases by a factor of one. At the surface (and sea level), we experience atmospheric pressure of 1, the accumulated weight of all the air above us. At 30 feet underwater, that pressure is 2. At 60 feet, it’s 3. Water is a lot heavier than air, so the underwater pressures change much faster than they do on land. To look at it another way, you have climb a 15,000 foot mountain for air pressure to decrease by half; you only have to descend 30 feet for the combined air/water pressure to double. The magic of the scuba regulator is that it detects the water pressure around you and matches the incoming air pressure you’re breathing from the tank to the surrounding water pressure, precisely. At 30 feet, which is not very deep, and a combined air and water pressure of 2, the regulator delivers air at twice the pressure that it feeds you when you’re swimming at the surface. You don’t feel this. But if you were only breathing air at surface pressure, you quite literally could not take a breath – the outside water pressure would be compressing your chest that much. Like I said, you don’t have to know or even think about this as you dive. You just breathe normally, and it feels perfectly okay in your chest, even at say 60 feet, when you’re breathing air at three times atmospheric pressure! But the water pressure has a subtle effect on your buoyancy. It’s a tricky concept, but buoyancy is about displacement. We float because we displace water with our bodies. Take a deep breath when you’re swimming on your back in a lake and you float better. Why? Not because you have more air in your lungs (as I’d thought), but because the expansion of your lungs makes your chest marginally larger – you displace more water and you’re instantly a little more buoyant. As you dive, your body doesn’t compress (because you’re breathing that pressurized air, and you can’t compress the fluids in your body), but other parts of your equipment do. Your wetsuit, which contains tiny air bubbles, gets compressed or flattened, even if only a little. So does the air-filled vest you wear. So as you descend and water pressure increases, you become slightly less buoyant, and you start to sink even faster. Yikes! 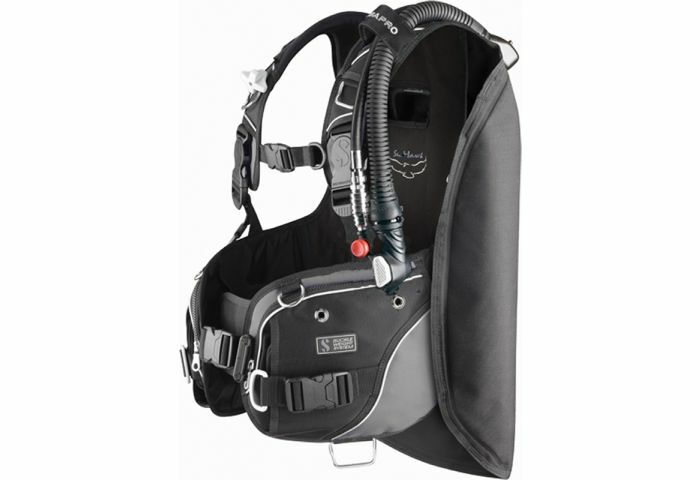 The second major invention of scuba is the Buoyancy Compensation Device, or BCD, which is built into the vest that holds your tank to your body. You wear it like a backpack and it’s inflatable, with air from your tank. You control this with two little buttons on a hose near your left hand. One button adds air (from the tank), the other button releases air (into the water). You add air when you want be more buoyant, and you release air when you want to sink. But in fact, while diving you have to constantly fiddle with the air in your BCD, at least any time you’re ascending or descending. Why? Because of the changing water pressure around you, which alters your “size” (your displacement) and therefore your buoyancy. This was my mistake at the outset of my first Maui dive, and the reason I’d been so carefully trained to ascertain what was going on. In order to descend in the first place, you have to release all the air from your BCD, so you’ll sink. But as you sink, and become less buoyant from the water pressure, you have to add air to slow your descent (but not too much, like I did). The opposite is true as you ascend. At first you have to add a little air to go up. But as you rise you become more buoyant (as water pressure decreases) and you have to release air so that your rate of ascent doesn’t accelerate out of control (but not so much that you start to sink again!). Confused? I told you it was a tricky concept. With practice this technique becomes automatic, but it’s a learned skill, one of the fundamental skills of scuba. Initially we practiced buoyancy control in the pool (we had to swim near the bottom in the deep end, hovering above but never touching the pool floor), but really worked on it for most of our four open water test dives. It’s a bit like when you first drive a video game car, overcompensating in each direction. You have to learn to be gentle, incremental and patient, and constantly in tune with your depth by watching your gauge and controlling your breathing. The other scuba lesson we got drilled on was to ascend slowly, especially after being underwater for a period of time. This is where “the bends” or decompression sickness comes in. One effect of breathing air that’s under double or triple normal atmospheric pressure is that it forces nitrogen (the major gas component of air) into solution in your blood stream and other bodily fluids. If you stay underwater too long, and/or ascend too quickly, the nitrogen comes back out of solution too fast, in bubbles, like carbonation out of a shaken soft drink when you pop the lid. That’s the bends. It’s difficult to treat (you need to get to a decompression chamber) and can be fatal. If you have a problem underwater (like running out of air), you can’t just shoot to the surface, particularly if you’ve been down there for a half hour or more. You have to rely on your buddy (who carries a spare regulator), and use it to ascend slowly. 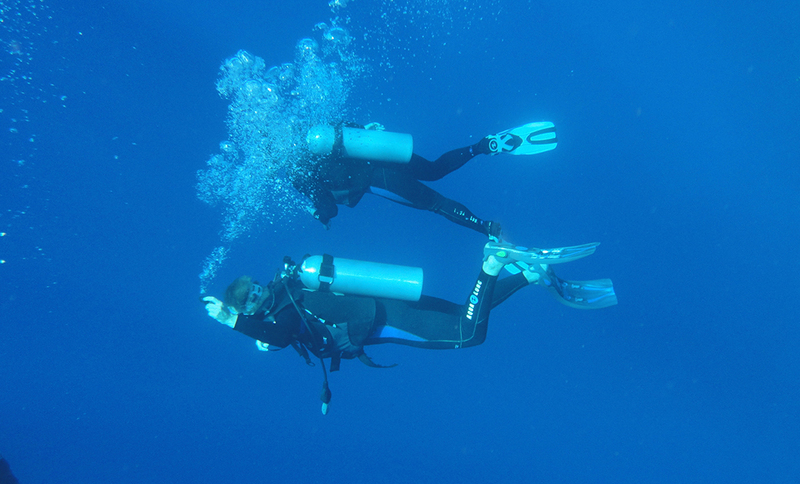 Ascending too fast is the biggest risk of scuba diving, apart from running out of air at the bottom. The long and short of scuba diving is that it’s highly unnatural for humans, just like flying. We use all kinds of technology to make it possible. But we can’t do it for long, and it includes real risks, which are managed with training and safety procedures. The deeper you go, the shorter your visit, because of the nitrogen thing, and also because you use up your air so much faster – you’re literally breathing much more of it the deeper you go, even though you’re absorbing only a fraction of the oxygen it contains. A single scuba tank contains about as much air as a phone booth, compressed to 3,000 pounds per square inch. (Younger readers, who’ve never used a phone booth, think of a very small closet.) That might be good for up to two hours of underwater breathing in a shallow swimming pool, but on a deeper dive, only 30–40 minutes, or less. We were taught from day one to monitor the air remaining in our tanks constantly (it’s displayed by a gauge on our diving console, right next to our depth), and to communicate that to each other with hand signals. The training part of scuba, especially the theory, is to understand the forces at play, and internalize them in your techniques. The practice part is get you to relax underwater, to not panic when something abnormal happens, to think calmly and rationally, and rely on emergency techniques, like breathing from a buddy’s spare regulator. The pool might seem like an artificial environment to learn scuba, but we played repetitive games designed to make us comfortable underwater and familiar with our equipment. For example, our whole class would sit on the bottom of the pool, breathing through our regulators and passing our masks around in a circle. Each time we took our mask, off our vision went blurry, so we had to reach for a new mask, put it on and clear it by blowing air out our nose to displace the water. After doing this 10 times, it became pretty routine, even if the first time it felt completely disorienting. This prepared us for accidentally getting a mask knocked off underwater, which would cause instant panic if you hadn’t practiced it before. Another exercise was called share the scuba, played in the shallow end so we could stand up at any point. We had eight regulators attached to four tanks in each corner of the pool, and we attempted to stay underwater by sharing the regulators between a dozen people. Sort of like musical chairs, only the chairs were our air supplies and you had to constantly swim between them while holding your breath. No one could breathe continuously out of a single regulator. When we’d done that for 10 minutes successfully, the instructors turned off one of the tanks, reducing the available air supplies to 6 for 12 people. Fun, eh? It wasn’t a competition; nobody drowned. But a student did drop out of the class because he ultimately found the underwater experience made him feel anxious. Those of us who passed the course gained all the basic skills we needed to dive in open water. My first ocean dive to the St. Anthony wreck off Maui wasn’t all that interesting. The old fishing boat had been sunk artificially, as an easy diving destination for beginners like me. It didn’t have a whole lot of coral growing on it yet, and the setup felt contrived. However, I was diving in 70 feet of water, deeper than I’d ever been before, and getting comfortable with my scuba skills in the ocean. That was plenty for me, and pretty fun too. This diving environment was fascinating. Gill led us almost immediately to a very small cave he knew, the size of a suitcase, where a small shark liked to hang out. He gestured at the group to have a look as he aimed his flashlight into the cavity. I honestly couldn’t see anything, but I gave Gill the “OK” signal nonetheless. We explored further along the reef, observing all sorts of aquatic life: pyramid butterfly fish, potter’s angel fish, a great barracuda. (I don’t remember these names and didn’t recognize Gill’s hand signals – he wrote them in my log book after the dive!) Every few minutes he would query our air pressure with a hand signal and we’d have to report. “1500 PSI” was indicated with one finger on the arm (for one thousand) and five open fingers in an outstretched palm. It meant my air supply was half gone. The group did spread out a little. In my Canadian training, we dove strictly with a buddy, who always had to be within arm’s reach, in constant communication. Diving with a group in Maui, and no designated buddy, was new and uncomfortable for me. Who would I turn to in an emergency, and would they be ready to respond within a critical few seconds? Nonetheless, Gill seemed hyper-aware of everybody’s status and whereabouts. When a diver reached 700 PSI, maybe 10–15 minutes of air remaining, Gill gave them the signal to ascend. We were diving from an anchored boat, and we’d been briefed to follow the anchor line to the surface, ascending slowly. At a depth of 20 feet we had to do a mandatory “safety stop”, pausing at between 15 and 20 feet for three full minutes. This is standard diving practice, to ensure the dissolved nitrogen in your body passes gradually (without bubbles) back out of solution into the air you’re breathing. 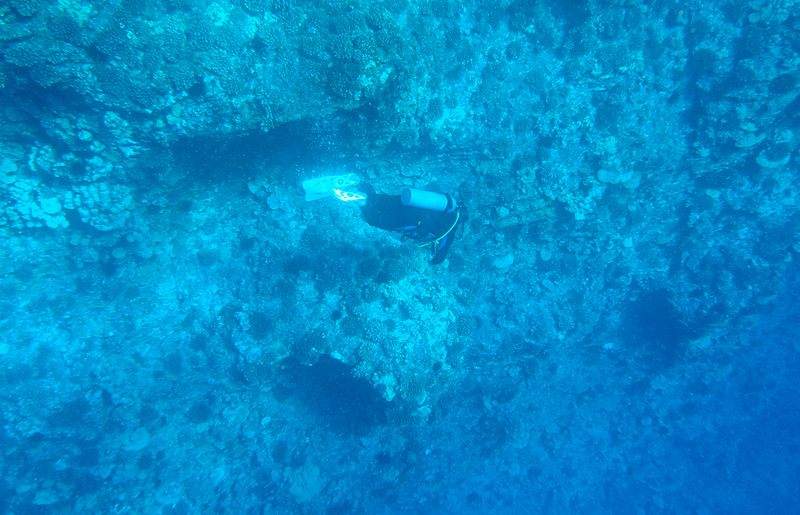 One diver lost control of his buoyancy during the safety stop on our first dive. Gill shot up towards him immediately, grabbing his ankle, and signalling him to re-establish his depth at 20 feet. He was being reprimanded through silent diver communication! On our second, Molokini dive, Gill had sent four divers to the surface, but two of us remained, with about 1000 PSI of air in our tanks (different breathing rates mean some divers use air more quickly than others). He led us back to the cave, as he seemed obsessed with his little shark. 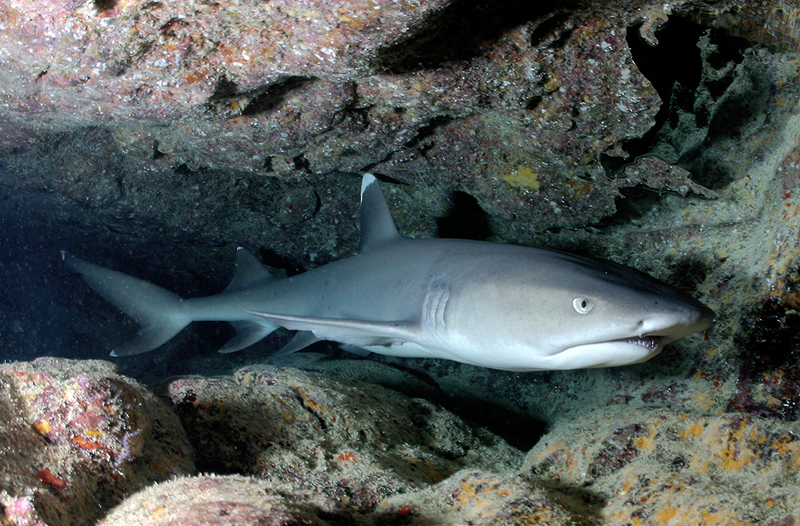 This time, with less crowding, I was able to see the white tip reef shark lurking shyly at the back of the cave. It was less than a metre long, ghostly white, just biding its time, perhaps waiting for small fish prey to wander by. I could almost see Gill smiling inside his mask as we made our way back to the boat’s anchor line. On our return swim, the sun broke through the clouds way up above, and a shaft of light penetrated to our level, 50 feet below. It was a gorgeous sight, highlighting some white sand on the bottom, some coral reef, and glinting off the sides of the fish swimming by. I stopped kicking my fins and paused, taking in the scene fully, temporarily forgetting about air pressure, my depth gauge and my buoyancy. It was beautiful; I couldn’t believe the good fortune of my morning. A year’s planning had clicked into place. My first dive trip with Gill was on a large boat with nearly 30 people. We dove in three groups of six clients, plus a leader for each group, plus another group that was on board to practice some sort of advanced diving skill. Scuba is a gear-intensive sport, even more so than downhill skiing. Maui Dive Shop, which led our dive, had an amazing system for keeping everyone organized, for switching to new air tanks between dives, and for the awkward task of getting a couple of dozen divers suited up and into the water efficiently and safely. At the end of the morning, they read off the data from the dive computers we each wore, giving us a personalized, written log of the depth and duration of our dives, and the time between dives – all crucial data in calculating the nitrogen accumulated in our bodies. Impressive! 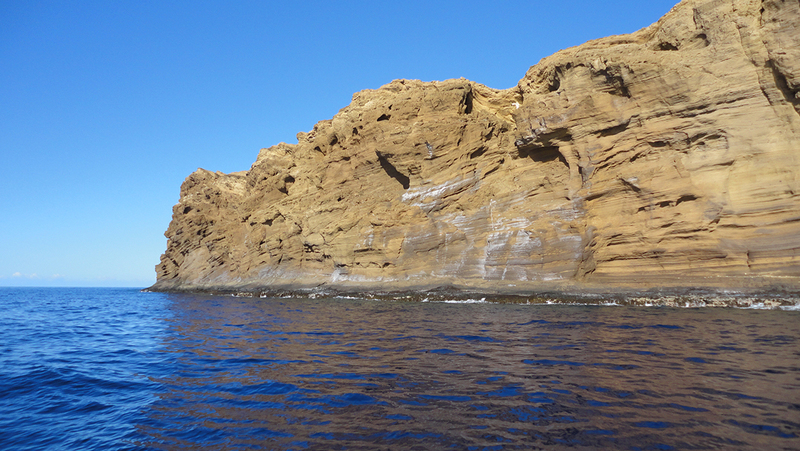 The back wall of Molokini is a lot bigger up close! For my second dive trip, the following week, I chose a much smaller outfit, Prodiver Maui, just for the contrast. It was a smaller boat, only five client divers in total, with four staff. Two leaders would be in the water with us (one in front, and one in back), and two would remain on the boat to follow our bubbles, since the boat wasn’t anchored, and to pick us up after we surfaced. This intimate, more closely supervised group allowed us to dive to my dream location, which Maui Dive Shop wouldn’t visit because of its nearly boundless depth – the back wall of Molokini that I’d first seen while snorkelling there the year before. By now, my third time diving in the ocean, I was more confident and comfortable. Almost immediately after we jumped in the water, Mike, our dive leader, spotted a Humpback Whale on the surface, not far away. He swam quickly towards it. I followed, very excited. We’d seen humpback whales in the distance almost every day in Maui. It’s the winter destination for the large North Pacific group of these whales, many thousands of them. They feed in Alaska in the summer, but migrate to Hawaii so the females can deliver their calves and mate again in the winter months. My wife Nichola and I had even seen a humpback whale up very close the week before, on a whale-watching trip. It swam languorously around our boat, seemingly very interested in us, as we oohed, aahed, and snapped photos. Although my eyes were almost bulging out of my mask, I couldn’t see the humpback under water, where visibility is less. We’d been warned that the whales are well camouflaged and hard to see unless you are very close. This whale moved away, apparently, before any of us had a chance to spot him underwater. Drat! We continued diving along the wall with Mike. He was very attuned to the sea life and pointed out things I would never have noticed, like a squid hiding in a small hole in the coral. I marvelled at the gentle currents pushing us around, even at a depth of 90 feet. I looked up to the surface, which seemed very far away. I had a serene moment when I simply hovered, stationary, suspended in a warm cocoon of blue water, my buoyancy exactly neutral, seemingly weightless as if floating in outer space. I felt no feeling of vertigo in the water whatsoever, as I’m sure I would have if I’d been skydiving! It felt safe, perfectly attuned to the marine environment. It was exhilarating. When it was time to ascend, after 35 minutes underwater, I was disappointed. I didn’t want the experience to end. This time, I was one of the early ones sent to the surface. Mike had released a vertical red balloon when the first diver’s air reached 1000 PSI, which showed the boat our location and gave us a route to the surface, up a line attached to the inflatable balloon. After my safety stop, which got measured automatically by the dive computer on my console, I surfaced and gave the two-hands-above-my-head “OK” signal to our boat. It motored over quickly to pick me up. I removed my fins, clambered aboard, and got out of my BCD, gladly shedding all the bulky weight of my gear. At that moment, the second staffer on board spotted a sea turtle swimming just under the surface, near the boat. “Want to jump in?” he quizzed me. He didn’t have to ask twice. I stepped back into my fins and donned my mask and snorkel, then stepped off the back of the boat. 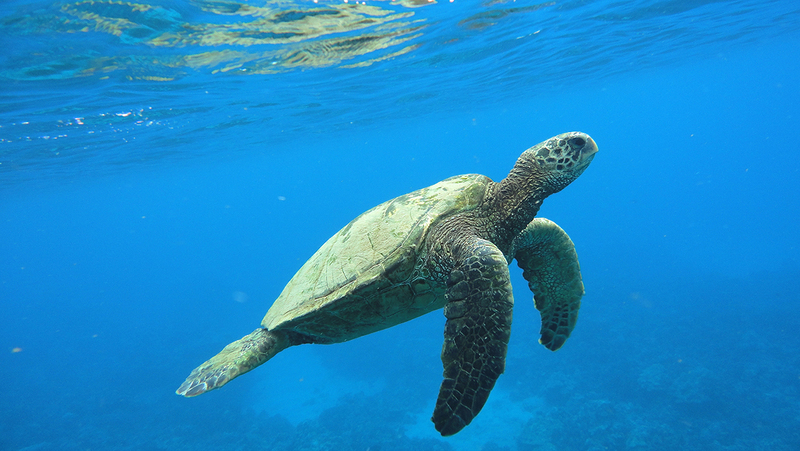 I’d seen sea turtles up close last year, while snorkelling. They’re the most amazing, prehistoric creatures. They lived during the time of the dinosaurs, and survived the cataclysm that wiped out most land animals because they live primarily in water. However, they do breathe air, and must surface periodically. I waited for my new pal to do just that. He swam along slowly, about 10 feet under, oblivious to my careful pursuit. “Are you okay here for awhile?” came a shout from the boat. Another diver had surfaced, over 100 metres away, and they had to go pick her up. But my attention went back to Mr. Turtle, who was now swimming up to the surface. How does he regulate his buoyancy, I wonder? And why doesn’t he get the bends? The turtle took a breath of air, then another, then just as quickly descended. I followed along the surface until I couldn’t see him anymore, his green shell blending in perfectly with the sea below. I wished I still had my scuba tank on, and could follow him down into his murky world. I look up for the dive boat. It seems a long way away, and is pointed away from me. I float very well in my wetsuit and start swimming towards the boat. After a few strokes against the wind and waves, I realize I’m not making very much progress. Hmm, I wonder. If they only have five guest divers that day, wouldn’t it seem pretty obvious if they turned for home with only four? But the boat swings around, races back to me a in few seconds, then turns and uses its jet water engines (no props spinning around down there, just whooshing water) to gently back in towards me so I can climb one of the two ladders on either side of the transom. I climb aboard to greetings from the staff, who want to hear all about my swim with Mr. Turtle. I strip off my gear, dry myself off quickly so I don’t get chilled, and pull dry clothes out of my gear bag. There’s a massive grin on my face that lasts for the whole, languid, 30-minute ride back to the South Kihei boat launch ramp. I couldn’t dive every day of my Maui holiday. It’s a solitary hobby, because my wife doesn’t do it. And it’s pricey, although not more so than golf or other gear-intensive specialty sports. I’m pretty sure the experience will provide months of day dreams. And I’ve ticked a major box off my bucket list, even though I’m sure I’ll want to tick it again and again, especially in warm water. I’ve sort of fallen in love with Maui, not the resorts and condos that line certain sections of the shore, but the wilder places – the northern shore of West Maui where waves break violently onto the exposed lava, and of course the undersea, where much remains to be seen and experienced. I’ll be back, some day. P.S. Watch a short video about my first dive trip here! What an interesting and informative account of your diving adventures in Maui and scuba diving in general. I loved how you tied the whole adventure into your youthful reading repertoire. I look forward to a re-read to absorb even more information. You always write so marvellously. I am very glad you have joined the scuba fraternity. Interesting description of your diving experience. Well written (I am jealous). How are the coral reefs in Hawaii standing up?